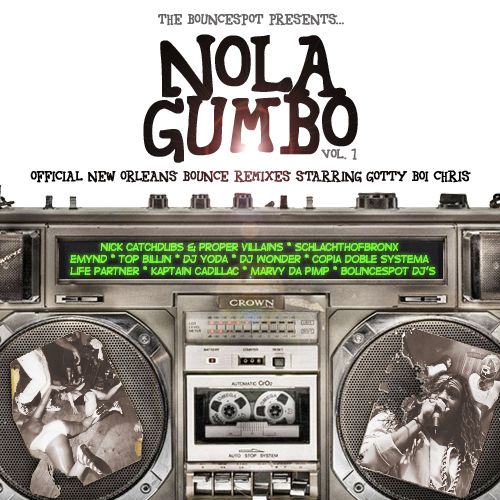 The Bouncespot released the long-awaited, first edition of their Nola Gumbo Remix – Compilation, today! Grab 20 Remixes of Bounce tunes from Gotty Boi Chris, Sissy Nobby, Darkskinn Jamaine DSJ, Big Choo and Vockah Redu, made by DJ’s and producers like Schlachthofbronx, Top Billin, DJ Yoda, DJ Wonder, Copia Doble System, Emynd, Kaptain Cadillac, Marvy Da Pimp plus many more! Pick them from this soundcloud set, one by one!